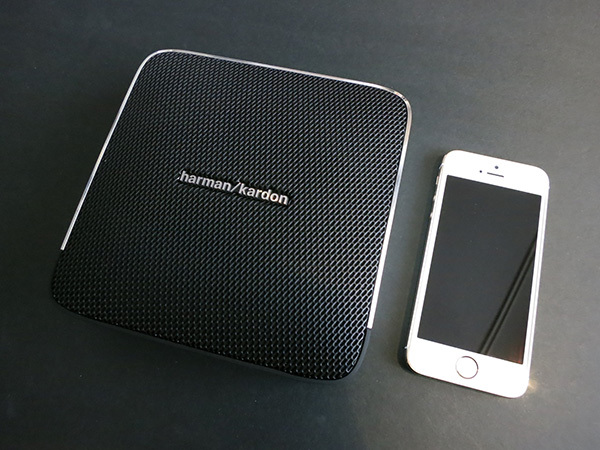 Harman Kardon’s Esquire is another Bluetooth speaker vying for your attention, wanting to play music from your smartphone or tablet or laptop. The official price for the Esquire is £170/$255 but you can pick up for around £120/$180 at retailers like Amazon. Bluetooth speakers can be found for more so it’s hardly outrageous. It has a somewhat unorthodox square design which allows you to either lay it down flat or stand it upright. It’s available in black, white or brown. The top side has large buttons for power, volume and other controls like playback. An LED indicates power and connection status while five small LEDs on the side show the battery level. Also on the side are a 3.5 mm auxiliary input and a Micro-USB port for charging. The device has a premium look and feel with an aluminium frame running round three sides and a rubbery plastic bottom which provides good grip. The rear cover is finished in leather, while the included carry case is a bonus. It’s relatively straightforward to pair the speaker for Bluetooth using the NFC option if you use a suitably equipped Google or Microsoft phone. Tap the devices together in the right place (which can be a little tricky) and the rest is done for you. A regular mini-jack input is included, useful if your device doesn’t have Bluetooth or you prefer the best-sounding connection. We note that the unit doesn’t advertise the inclusion of the aptX codec, so assume it can only use the lower-quality SBC audio codec when receiving digital audio over Bluetooth. A neat feature which now common for wireless speakers is hands-free phoning with your smartphone. A button on the speaker mutes the microphone; long pressing the phone button activates voice control on your phone. For its mid-range price point the sound quality of the Esquire is just satisfactory. It’s by no means poor but equally doesn’t produce anything special. The speaker has an impressive sense of musical speed and, like many Class D amplifier products, sounds more impressive at higher volume levels. It takes two 45 mm drivers each driven by 10 W amplifiers, with a specified frequency response of 80 Hz-22 kHz. Overall we’d describe the sound as flat but with a couple of crests – we expected a little more for the price. Bass is pretty punchy even without a dedicated bass driver or passive radiator, but it can get overpowering depending on the type of music you’re listening. The mid-range is fairly dull but vocals are usually clear which makes up for this somewhat. The higher frequency range is drowned out by the mid-range. Pump the speaker’s volume up and the sound fills out. Harman Kardon lists battery life at 10 hours. In our tests we found after around that point of steady playback we still had about 40 percent left – according to the LEDs on the side anyway. 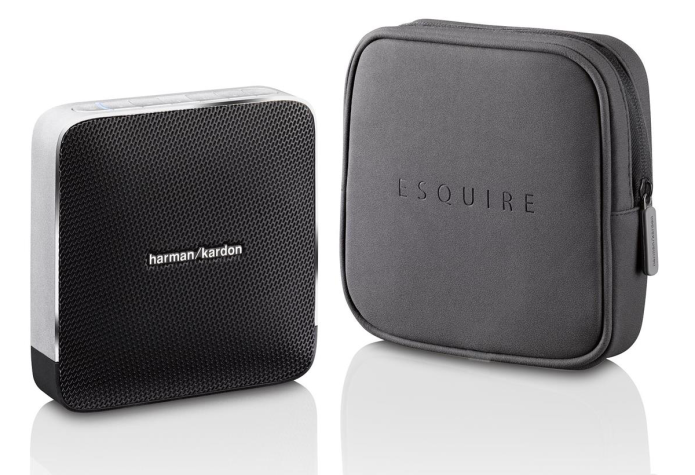 The Harman Kardon Esquire delivers on style and build quality with its premium look and feel. It also provides impressive battery life and additional features like NFC pairing, controls and hands-free calls. However, sound quality isn’t as good as even the online price tag would suggest.